Boston, MA, February 22, 2019 --(PR.com)-- Smart Drug Testing, LLC, previously owned by the Accipiter Group, LLC, has announced that it has been acquired by James A. Greer, President and CEO of Accredited Drug Testing, Inc. This acquisition is the continuation of Mr. Greer’s expansion of his companies drug, alcohol and DNA testing services nationwide. The Boston, Massachusetts location of Smart Drug Testing is a state of the art facility, located at 240 Commercial St, suite 3A Boston MA 02109 and will provide additional drug testing services for employers and individuals including USCG and DOT drug testing, court ordered drug Testing, DOT consortium enrollment, employer drug policy development, background checks and drug testing training programs. As the President of Smart Drug Testing, Mr. Greer stated, "With this new acquisition our commitment to providing comprehensive drug and alcohol testing services in the Boston, MA area will continue by offering new services and extended hours of operation." 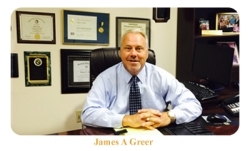 Jim Greer is considered one of the nation’s leaders in the drug and alcohol testing industry and he has extensive experience in founding and managing multi-million dollar companies in addition to his political and business experience. In addition to Smart Drug Testing, LLC, Mr. Greer owns and operates Accredited Drug Testing, Inc., Coastal Drug Testing, Inc, Health Screenings USA, DNA Answers and American Drug Testing. He has been recognized for his entrepreneurial spirit by INC Magazine, the Chamber of Commerce “Business Person of The Year,” Who’s Who Global Business Leaders and Business Forum Limited. He was awarded a degree from Seminole State College and is a graduate of Cornell University Executive Leadership Program. Mr. Greer also serves as a member of the Board of Directors of the National Drug and Alcohol Screening Association (NDASA) and chairs the associations Governmental Affairs Committee. Smart Drug Testing offers 5, 10, 12, 14 and 17 panel drug screenings for small, medium and large employers and individuals needing a court ordered drug or alcohol test. Available testing methods are urine, hair and oral saliva. Customized panels are available upon request. Alcohol testing is available utilizing breath alcohol testing devices (EBT) and ETG testing. Smart Drug Testing also specializes in the implementation of a company’s drug and alcohol testing program, which will designate an employer’s business as a Drug Free Workplace and may provide discounts on workman’s compensation rates. The staff of Smart Drug Testing is committed to providing all drug and alcohol testing services in a professional, friendly and confidential manner and all Smart Drug Testing staff are certified in DOT and Non-DOT drug and alcohol testing procedures. Our testing services include MRO verification and we only utilize SAMHSA Certified laboratories. In addition to the Smart Drug Testing Center in Boston, MA, additional drug testing centers are located in the following cities Oklahoma City, Memphis, Los Angeles, Miami, San Diego, New York, San Antonio, Charlotte, Chicago and Dallas.